Guild Tattoo: Cyan and it’s on her left ankle. 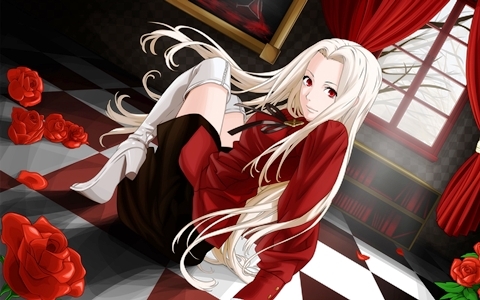 Physical Characteristics: Saya is partly unique in her appearance with her white-white hair and red eyes and almost white skin. These characteristics may categorize her as Albino, which states that her cells are without color. It doesn’t bother her to much and in truth, she likes her looks. Her hair, while it used to be a constant source of bullying, is long and soft. It cascades down her back and waist like a rushing waterfall. And when in the sunlight her hair shimmers like ice and snow on top of the highest mountain peaks in the Northern regions of Fiore. Saya isn’t fond of her eyes because of the color. It’s too ‘demon-like’ she would usually say to those who question her about it, but she would shortly say that she loves the shape of them. It’s wide and innocent similar to cute furry animals, most particularly a doe or a kitty. Her skin can be compared to the palest shade of peach, and not at all near a sickly color to be described as pasty. The rest of her body is typical of a woman conscious of her body. Saya about average height for a woman her age, around five feet and five inches. Her body ratio is more leg than torso so someone can say that she’s quite speedy. She’s also not that athletic but enough to dance around the battlefield to dodge incoming attacks or to get to the designated meeting point. Attire/Clothing: Her preferred styles of clothing are mostly simple and manageable. Saya is mostly drawn to button up blouses, plain colored skirts, and the occasional dress. A red blouse that’s long sleeved with cute, slow frills is her favorite top. It’s actually made of thick and durable material that won’t rip or stain at the slightest poke or things being splattered on it. In combination with that top is a white skirt that clings to her hips and flaring out in soft waves. And under the skirt are black tights that keep her legs warm if it’s a bit chilly. She also adds in a thick white coat if she ever travels to the snowy parts of Fiore. As for footwear, Saya tends too gravitate too tall, high-heeled boots. Even the other members of Melodic Sirens say she has to many of them to count. That’s just her casual outfit though. 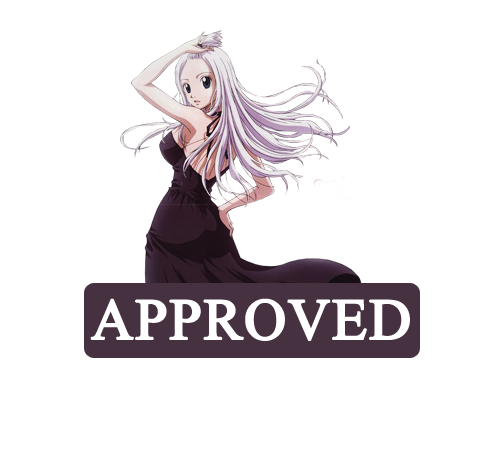 At home or in the guild base, Saya wears this long and flowing white dress trimmed with shiny golden silk. The materials used to make the dress is the same as her favorite top. It might even be a bit heavy because there are two layers to it. The bottom layer is the tough material (though it’s quite comfortable to be in), and laying over it is a slightly thinner one that create folds when it’s hanging from the waist portion. The sleeves don’t go over the shoulders but around them so it shows some amount of skin. 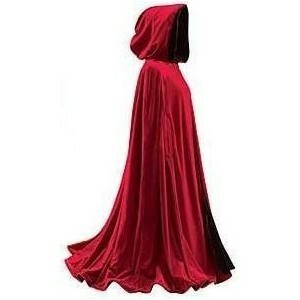 The most distinct item in her wardrobe is her red cloak, or cloaks. Saya has a closetful of them, all varying in the smallest of details. She has them custom made by a small family clothing store in the northern part of Waterfall City. 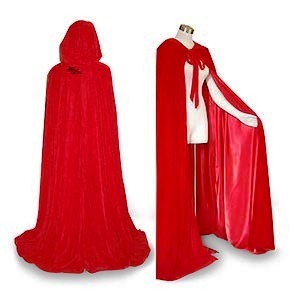 Her cloaks are always a tasteful red and made of sturdy cotton with the other layer being a soft velvet cloth. The length of the cloaks are never higher than the bottom of her ankles, the exception being the few ones that have the front part ending at the waist. Abnormalities: Saya has a small burn scar shaped like a five-pointed snowflake on her right forearm. It’s a slightly dark beige color so it might stand out if someone is looking for it. Personality: Saya can be a bit bipolar, but not obviously so. On one hand (her friends say it’s her outer persona), she’s all smiles and laughter. She likes to play hostess and make sure that everyone is having fun and not at all upset when in her company. If Saya feels like there’s something bothering a friend or even a stranger, she wouldn’t hesitate to ask what’s wrong. That might make her seem like a busybody, however she’ll stop if she thinks it will make that person dislike or even hate her. Saya is also quite modest so she’ll probably deny most compliments and try to point out that someone else is better, or she’ll even try to change the subject. As much as she sticks out in a crowd, Saya likes to stay in the background as much as possible because she doesn’t do to well when a lot of people’s attention is on her. Examples would be more than five or six people, though it wouldn’t matter when it’s just her and the members of Melodic Sirens. Her inner-self is probably that one person that no one likes because she likes to brag even though it’s unintentional. She simply wants everyone to know that she’s there. This side is also sarcastic, snippy, and doesn’t like to be stopped when she’s talking or doing anything she feels is important. Saya’s inner-self can be considered her negative side because it usually embodies her jealousness of others and other bottled emotions that she pushed aside in favor to seem more happy so that others wouldn’t worry about her. Again, it’s not so obvious when either persona is active because it’s a bit of a balancing how much is let out on either side. Saya can be modest but her ego is being inflated, or she’ll try not to be pushy but does it it anyways because it might be important to her. And if something is simply too annoying to ignore or pretend to be nice Saya will start being snippy with her responses. “Polite but rude,” is what some of her friends described her when she was in one of those moods. - Cooking and baking. It might be a tedious task when cooking for a lot of people but it calms her down. She likes to busy herself with making sure it tastes good and the people like it. - Singing. She knows that she’s not the best (and certainly not the worst) but just like cooking and baking, it lets her relax and be at peace. The only time she sings though is when she’s alone. Saya might even try to dance and she’s horrible at it. - Running and swimming. Not super at it, but not pitiful either. Saya does these to keep herself in shape and flexible. - Helping people. It’s probably in her nature to go out and help people. If she sees an unfortunate person by an alley or by the road, Saya will offer him or her something to eat and a blanket. It constantly eats at her money but it makes her feel good. - The colors red and white. They’re her absolute favorite simply because it goes with her looks. It also corresponds with her month of birth which celebrates love and closeness to friends and family. - Food. It might be because she burns a lot of energy and calories while running and swimming, but Saya can eat a lot. Her favorite would be those with a lot of carbs like pizza, potato chips, pasta, and cakes. - Pets. Saya has a soft spot for them, especially dogs. The reason being is because they’re loyal and is always happy to their owners. - Green. It’s a beautiful color by itself, but Saya would not be caught dead ever wearing it. With her red eyes and white hair, adding the color in would make her look like christmas tree. - Overly happy or depressing people. Dealing with either makes Saya feel as if she’s either too lucky in life or not grateful enough with what she currently has. - Beer or smoking. Note: beer, not alcohol. Saya tried beer once and immediately spat it out. How men and other women drank it did not make any sense to her. It’s absolutely disgusting. The same with smoking. The first time she tried it, Saya ended up coughing and felt light-headed. - Mean people. Saya doesn’t like it when some person continually bullies or insults a person who can’t or doesn’t want to fight back. The amount of bad words or crudeness makes her uncomfortable and annoyed. Inspiration: Saya’s inspiration to becoming a mage is survival, protection, and acceptance - a fun, full life overall. She’s had a pretty rough childhood that had her wanting for people's constant attention and praise. If she wore beautiful clothes and was pretty and also a strong mage then people will love her unlike the people in her childhood. - Insects, snakes, and other reptilian animals. She likes watching them from a distance but Saya will always be afraid of them and have nightmares. Every time someone points out there hairy legs or scaly bodies, she would shiver and want to scrub herself clean. - Dying. It’s human nature to not want to die, but Saya is determined to keep on living. The thought of dying young and even at an old age scares her to death (pun intended). If Saya was ever offered a full-proof way to stay immortal she would take it. - Dragons. She’s heard of the war against them and how easily they could wipe out the human race. Saya even heard of the recent rumors of the dragons returning and eating up people again. Augment Description: This is only for RP purposes. With Empathy Aura, Saya can sense, feel, and see (they have some sort of colored glow around their figure) how a person or creature is feeling no matter how they expertly hide it. This can also mean that she can tell if someone is lying or telling the truth by how sincere or meaningful they feel. At times she can also be “influenced” by the emotion if it’s very overwhelming. An example would be a person’s bloodlust on a battlefield or a person’s intent to kill (outside a battlefield). I don't think I'll be using any equipment either. Her nickname was Yuuki-Onna, the Snow Woman. It had stuck with her since her birth as she had been born on the coldest of nights and a snow blizzard howling just outside her family’s hut. Not long after the blizzard though, she was taken to the highest peak on Mt. Hakobe (she and her village were one-fourth up the mountain) and left there to die because of her abnormal looks. By miracle or by magic, Saya had survived by herself until being taken in by a large bear. For a year and a half Saya had lived with the bear, eating raw meat and the ever rare berries that were able to grow in the cold climate. Her village, the one that lived further down the mountain, had been running out of food and sent out a hunting party to gather more food. It was then that the hunting party came across the bear and Saya in the back of a tunneled cave where it was warm enough that the hunters shed a layer of their clothing. They killed the bear both as food for the upcoming winter and fearing for the baby’s life. It wasn’t until they returned to the village with their kill that they saved the rumored “cursed demon baby”. Her survival was a controversial topic amongst the villagers. Is she really the same baby? If she is then did she return to extract vengeance upon them? In her time at the village, Saya was kept in her parents’ hut and tucked behind boxes in the corner so they wouldn’t have to look or even deal with her until it was time to feed or tend to her. Her parents were deathly afraid of her but continued to provide for her as they believed that if they appealed to her then she would spare them. But Saya was only a baby, a child. What she wanted most was the warmth of another human or even a creature. This drove Saya to do anything asked of her in the village. She wanted to please them so that they could love her as she did them. However, as she grew older and began to take in how much the village actually hated her presence among them, Saya thought it was time to leave. They didn’t object to her leaving, they didn’t even gave her any materials that would help her get through the harsh coldness of the mountain. The only exception is a beautiful red cloak that would keep her somewhat warm. 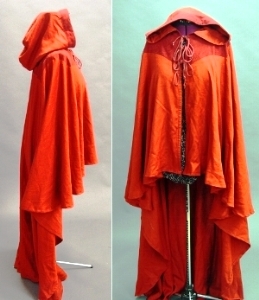 Saya treasured the cloak because she believed that it was the only sign of their kindness to her. She was Yuuki-Onna, the Snow Woman. Demon incarnate of Mt. Hakobe. To her surprise Saya managed to make it down the mountain. Food and water was hard to come by as she didn’t know what the basics of survival are except for: “get food, water, and shelter, everything else can come later.” There were times that Saya got lucky by eating delicious looking berries and taking in their juices, but with no meat to eat she grew skinny and weak until she finally got the guts to kill a small animal and cook it (at least they gave her a fire-making tin). Saya continued to survive just by the thinnest of threads until she was given shelter by a travelling family. They were headed towards Waterfall City, the family’s hometown. Saya stayed with them until she managed to get a decent job and found a place on her own. Of course, they had to teach her how things worked but Saya caught on quickly when it came to cooking and other homely chores. Saya didn’t consider them family as they only stayed until she was living comfortably. Even though she was doing well with her current pay, Saya wanted to buy things like everyone else. She wanted to live a fun and comfortable life. Her chance came when she was serving a group of mages from Melodic Sirens just before the end of the night. As rumored, they were beautiful and classy and they looked strong too. Gathering her courage Saya asked them how to join their guild and they offered to take her to their guild tomorrow. It went well, their meeting and small tour. By the end of the afternoon Saya had acquired the guild tattoo and moved into one of the rooms in their guild homes. I'm already calling dibs on this application. I'm bumping this now Syrena! I hope I didn't do badly.